Our day begins at the port where the day's activities are explained to us briefly.We then set off immediately by taxi for the fantastic Chankanaab Adventure Beach Park*, which is situated in a natural reserve, where the flora and fauna are protected and unspoiled. Here we are assigned lockers, then a qualified instructor describes the program and explains the necessary safety regulations. At this point we are ready to enter the water on a submerged platform and get to know the dolphins. While we are in the water, we have the opportunity to touch and caress* these happy and playful creatures and to learn a great deal about their behaviour. At the end of this unforgettable experience we have time to enjoy at our leisure all the attractions of the park: the pure white sand beach dotted with palm trees, the beautiful lagoon, surrounded by lush vegetation, or the botanical gardens, where we find enormous flaming red heliconias and other spectacular tropical plants interspersed with interesting replicas of Mayan ruins. This programme oversees an encounter with the dolphins and not a swimming activity. Children under approximately 120 cm in height must be accompanied by a paying parent or guardian. 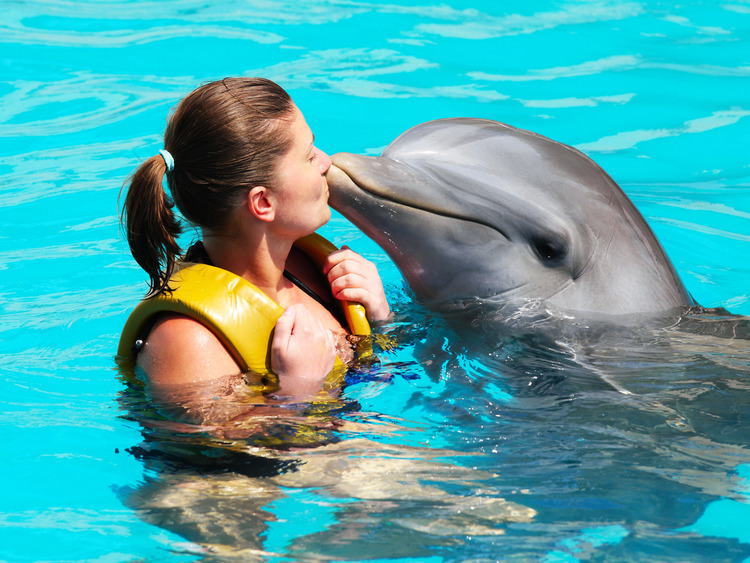 When in the water, during the dolphin encounter, only underwater cameras are permitted.